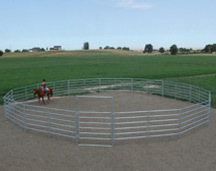 The Noble Round Pen provides a safe, controlled training area for you and your horse. Built to any diameter you desire, with your choice of 3, 4, 5, or 6 rail panels. Easily assembled or disassembled for a portable or permanent application. Noble Panels will help you design the perfect riding arena for your specific needs. Built in any length and width with your choice of 3, 4, 5, or 6 rail panels. 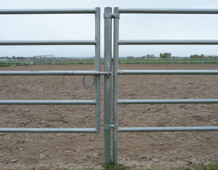 We manufacture a solid round pen that can be built in any diameter. The ultimate training pen for those who want their horse's undivided attention. Also available as an arena for cutting and cow horse events. When wood is inserted, the bottom of the panel will be 10" off of the ground. 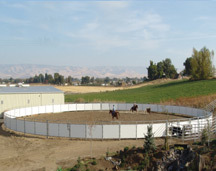 Our solid Low Cutter round pen can be built in any diameter. 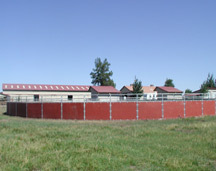 The ultimate training pen for those who want their horse's undivided attention. 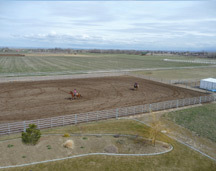 Also available as an arena for cutting and cow horse events. When wood is inserted, it will have a solid panel all the way to the ground. Noble Panels offers a variety of panel hardware, gate latches , gate hinges, and support posts.